To Cite: Shafiee-Kandjani A R, Noorazar G, Shahrokhi H, Nazari M A, Farhang S. Effect of Parent Management Training on Attention, Response Prevention, Impulsivity and Vigilance of Boys with Attention Deficient/Hyperactive Disorder, Iran J Psychiatry Behav Sci. 2017 ; 11(3):e4834. doi: 10.5812/ijpbs.4834. Background: Executive function of the brain consists of organizing, shifting attention, monitoring, self-regulating, inhibition and working memory, which are diversely affected in attention deficit/ hyperactivity disorder (ADHD). Parent management training (PMT) is a major intervention for ADHD with significant impact on clinical symptoms. However, little is known about its effect on cognitive aspects of ADHD. Objectives: The aim of this study was to assess the effects of parent management training (PMT) on attention, response prevention, impulsivity, and vigilance of males with ADHD as well as their clinical symptoms. Methods: In this clinical trial, 32 subjects were recruited from a child and adolescent psychiatric clinic in Tabriz, Iran. Participants (all males) were divided to 2 groups. One group received routine clinical care plus 8 sessions of PMT and the other group only received routine clinical care as a control group. Clinical symptoms were evaluated by Conner’s rating scale and performance of children in terms of executive function was tested by the continuous performance test (CPT) and Go/ no Go test before and after the intervention. A follow-up measurement was performed at week 12. Using SPSS 17.0 statistics, chi-square and independent-sample t tests were used to compare sample means. A two-way repeated measures analysis of variance (time-treatment interaction) was also performed. Results: Parent management training had a higher effect on hyperactivity (P = 0.032) and oppositional (P = 0.007) symptoms of children. Commission errors (reflecting impulsivity and response prevention), omission errors (reflecting inattention), and reaction time (reflecting vigilance) in Go/no Go test were not significantly different between the 2 groups. Omission errors in CPT and the reaction time significantly improved in PMT and routine clinical care (RCC) group (P = 0.032). Conclusions: Parent management training may improve executive functions in children with ADHD in terms of reaction time and omission errors. Attention deficit hyperactivity disorder (ADHD) is recognized as a neurodevelopmental disorder science the 20th century. It is common disorder (1) accompanied by a wide range of problems; children have an age-adjusted hyperactive state, fail to keep consistency in finishing duties, and have deficits in self-regulation of interaction with peers (2). These symptoms and their complications may continue through adulthood, especially when co-morbidities also exist (3). Furthermore, ADHD is also linked with a wide range of cognitive deficits (4). Based on a neuropsychological theory, symptoms of ADHD arise from a primary deficit in executive functions (5), in which an appropriate problem-solving set is maintained to attain a defined goal. Executive function of the brain has a major role in daily life and achievements (5). Results of neuroimaging studies on children with ADHD were correlated with these clinical descriptions and revealed deficits in cerebellum and the frontal cortex of the brain, both of which have a fundamental role in planning, organization, decision making, time perception, inhibition, and thinking (6). Because of a complicated nature, these neurocognitive processes are neither included as diagnostic criteria nor as available treatment strategies. Burden of ADHD is not limited to the affected person. Although parents of children with ADHD experience a higher level of stress related to parenting and frequently feel inefficient (7), negative parenting styles influence symptoms, comorbidities, and long-term outcomes of ADHD (8). Parent management training (PMT) has been introduced as one of the main interventions for these children (9). Several studies have reported benefits of PMT on children with ADHD and their parents (10-12). Parent management training improves parents’ ability in giving directions and increasing flexibility of their children and classroom behavior (9). The effect size for PMT has been reported in a range between 0.34 and 0.88 for different results in children’s behavior (13). Executive functions may not be the most apparent symptom, yet have an essential role in all aspects of life. Despite the importance of executive function, it is rarely included in evaluation processes, and efficacy of treatment methods are mostly appraised using scales compatible with diagnostic criteria. However, studies have examined therapeutic effect of approved medications on executive ability of patients with ADHD (14-16). To the best of our knowledge, no study has yet examined such effect for PMT. The current study aimed at objectively evaluating the effect of PMT on some aspects of executive functioning (including attention, response prevention, impulsivity, and vigilance) of males with ADHD as well as their clinical symptoms. The present study was an 8-week randomized controlled clinical trial conducted during July to December 2014. The trial was conducted at a child and adolescent psychiatry clinic of Tabriz University of Medical Sciences. The procedure was approved by the regional ethical committee. A comprehensive explanation about the aim of the study was given to participants and they all provided a written consent. At the end of the study, the PMT program was introduced and available for parents, who were selected as controls. All male children (6 to 12 years old), who attended the clinic during 6 months of the study, and were diagnosed with ADHD (mixed type) for the first time, were selected. The diagnosis was made by a child and adolescent psychiatrist using a semi- structured clinical interview based on diagnostic and statistical manual-fourth edition-text revised (DSM-IV-TR) criteria (17). A thorough physical examination was a part of all diagnostic procedures, where further evaluations were performed based on clinical decisions. Children with a comorbid psychiatric disorder, IQ of less than 75 (based on Raven’s progressive matrices test) and a disabling general medical condition were excluded. Children were also excluded if parents declined participation in any educational program and they were also excluded in case of three sessions or more absences during PMT. Severity of symptoms was recorded and selected children were randomly allocated to 2 groups by using a schedule generated by RandList. Parents of the intervention group were invited to participate in PMT sessions while their children were receiving routine clinical care (RCC). Parents of the other group did not receive any specific educational material. The RCC included psycho-education (about the disorder, treatment, and outcome) and treatment with medication (methylphenidate, dosage based on weigh, and clinical response). Severity of symptoms was measured again after 8 weeks by an investigator blinded to allocation of parents. A follow-up measurement was conducted 4 weeks after ending of PMT sessions (week 12). From the total of 53 children, 32 fulfilled the criteria and were randomized to 2 groups. Parents of 7 children from the RCC group were not available for follow- up measurements. Flow diagram of the study is presented in Figure 1. The K-SADS-PL is a semi-structural psychiatric interview for detecting psychiatric conditions in children, based on the criteria defined by diagnostic and statistical manual for mental disorders, 4th edition (DSM-IV). The Farsi version of this standard tool (18) was used to establish diagnosis in participants, as well as defining excluded children. The kappa value for consensual validity of diagnosis was 0.41 to 1.0 for different diagnoses. The kappa value for its test-retest reliability was 0.41 to 0.81 and good to excellent sensitivity and specificity and positive and negative predictive validity values were reported for nearly all of the disorders (18). This interview lasted between 45 to 90 minutes for each participant. The short form of this questionnaire was used in this study, including 4 subscales of oppositional, cognitive problems/inattention, hyperactivity, and ADHD score. The test had a high reliability and constructs validity (18) and has been successfully used in several studies for different populations worldwide. Its reliability has been reported as 0.93 in Iran (based on Cronbach’s alpha coefficient) and its validity was between 0.76 and 0.9 (19). The CPT is a task-oriented computerized assessment of attention-related problems, useful for the process of diagnosing ADHD. This test indexes the respondent’s performance in areas of inattentiveness, impulsivity, sustained attention, and vigilance. In all forms of CPT, the respondent has to sustain attention to a relatively simple auditory or visual stimulus and act in response by pushing a button. Two types of errors are described: omission, measuring sustained attention, and commission, measuring both sustained attention and impulse prevention. A reaction time was also reported (20). A CPT test was designated by authors using the visual stimuli. This test lasted for 14 minutes with 20% of the stimuli being a target stimulus. After performing the CPT test, children rested for 5 minutes and then the Go/No go task was carried out. These tasks measure the ability of response prevention. Participants are supposed to give a specific response when facing a “go” stimulus and prevent that response when a “no go” stimulus is presented. In the current study, a 5-minute task was designated with audio stimuli, where 50% were “go” stimuli. Validity and reliability are described elsewhere (20). “Raven’s matrices” are the most common and popular test administered to people aged above 5 years old. This nonverbal test is made of 60 multiple-choice questions, listed in order of difficulty (21). Its reliability and validity in Iran (based on Cronbach’s alpha coefficient) was reported as 0.91 and 0.73, respectively (22). Parent management training (PMT) program consisted of 8 sessions, each lasting 90 minutes. A child psychiatrist addressed the instructions in social learning principles and techniques, foundational concepts in behavior modification; proper rules of giving order, reinforcement and punishment techniques, as well as psycho-education about ADHD. The detailed content of these sessions are described elsewhere (23). Each session began with reminding the patient of the previous session and task; all parents were asked to explain their experience with the techniques so they could share ideas and solve the problems. The present study, as a clinical trial, aimed to assess the effect of an independent variable (PMT) on a dependent variable (response prevention). A sample size of 15 samples for each independent variable is suggested for these kinds of studies (24). Data are described as mean and standard deviation. Normality of distribution of data was checked by Shapiro-Wilks. As all of the data were normally distributed, chi-square and independent-sample t tests were used to compare sample means. A chi-square or student’s t test evaluated differences in the baseline characteristics between the groups. A two-way repeated measures analysis of variance (time-treatment interaction) with a two-tailed post hoc LSD mean comparison test was also performed. The type of intervention as a between-subjects factor (group) and time of measurements as the within-subjects factor (time) were considered as the cognitive and clinical parameters. Differences were considered significant at P < 0.05. From a total of 32 cases, 16 children and their parents were randomly assigned to each group. Characteristics of children are described in Table 1. Abbreviations: PMT, parent management training; RCC, routine clinical care. The participating parent in PMT sessions was the mother for all but one of the children, whose father took part in the sessions. Each parent was on average involved in a minimum number of 7.6 and 6 sessions. These parents participated in 1.2 sessions together with their spouses. At the end of PMT sessions, 25% of parents found the intervention highly effective, 50% reported moderate effect, and 25% reported minimal effect while none of them found it ineffective. Beside appraisal by parents, clinical symptoms of children were evaluated by a rating scale, as described previously (Table 2). The repeated measurement analysis showed a significant time-group interaction for hyperactivity, opposition, and total ADHD score of Conner’s rating scale, and these scores had a decreasing pattern in PMT and RCC group compared to children, who received RCC alone. This result was not achieved for inattention score. aNumber of children is 16 for all columns except for week 12 of RCC group which includes 9 children. Cognitive performance of children before and after the treatment is described in Table 2. The repeated measurement analysis showed that the difference between measurements, effect of group, and the time-group interaction for omission errors in Go/no go test were not significant. The commission errors in Go/no go test decreased significantly during measurements, yet effect of group and the time-group interaction were not significant. As described in Table 2, the differences between measurements, effect of group, and the time-group interaction for reaction time in Go/no go test were not significant either. The repeated measurement analysis showed that omission errors in CPT test did not show a significant change during measurements, yet the time-group interaction was significant and had a decreasing pattern in PMT and RCC group. Difference of scores of commission errors was not significant between 3 measurements, nor was the time-group interaction. However, the reaction time was significantly decreased during 3 measurements and was significantly more obvious in PMT and RCC group. The present study showed that hyperactivity and oppositional symptoms of children with ADHD had a significant decrease when PMT sessions were provided for parents along with routine clinical care. The omission errors and the reaction time of children were also improved as evidence of therapeutic effect of PMT on cognitive performance of these children. As children grow up, executive functions help them engage in imaginative play with peers and follow the rules of games. This function of the brain is fundamental for both academic and social outcomes. In addition to the child’s biological characteristics, such as genetic influences, underlying temperament, and neurological development, environmental factors such as parents, peers, and schooling have a significant contribution to executive function skills. In the other words, executive functioning is shaped (thus influenced) by a complex interplay between these factors (25, 26). Evidence suggests that parents’ guidance is one of the primary experiences contributing to children’s executive function during early childhood (27). The structure and approach of parents’ behavior are amongst the targets of PMT. Despite several studies that have evaluated the effect of PMT on behavior of children, to the best of our knowledge, there were no reports on beneficial effect of PMT on executive function of children with ADHD. Results of this study highlight the beneficial effect of PMT, not only on the clinical symptoms, but on the cognitive improvement of these children as well. Unlike PMT, medications (i.e. the other arm of treatment) have been evaluated for improvement of executive function in ADHD. Memantine could improve inhibition in an adult sample with ADHD (15). Studies have reported that OROS-methylphenidate could significantly improve reaction time variability, and commission errors in CPT (16). Furthermore, among adults with ADHD and clinically significant executive function deficits, lisdexamfetamine dimesylate was associated with significant improvements in self-reported executive function ratings (28). Same results have been reported for children (29). These studies differ in method of recruitment and measurement of executive function. However, the common point is their positive effect. On the other hand, most of these studies have examined adult samples (30). Results of this study provided evidence that PMT could improve reaction time and omission errors. Omission errors include “a mistake that consists of not doing something you should have done’ and was decreased at the same time that children could react more rapidly than before. The fact that this change was related to altered parenting because of a method based on child/adolescent adjustment, it could be suggested that other aspects of ADHD might be the underlying reason, such as level of arousal. This means that when the child is helped to adjust better to the environment, a better cognitive performance will be achieved. Childhood seems to be the critical period for development of executive function of the brain, thus children with ADHD might benefit from PMT if applied on time. Deficit in inhibition may be of the core symptoms of ADHD (31). Inattention and hyperactivity may be a result of deficit in inhibiting attention to inappropriate stimuli. According to the results of the present study, PMT could decrease omission errors and improve the reaction time measured by CPT. These results were not replicated by the Go / no Go test. This may be because of the type of the stimuli, which was auditory and more exciting for children, or because CPT was performed first and children got unprovoked for the Go / no Go test. The inattention score in the intervention group did not differ significantly after treatment, while the omission score did so. This may be explained by the complex relationship between these skills. High omission errors do not directly indicate inattentiveness; a slow reaction time with high commission and omission errors indicates inattention in general (32). The same complexity accounts for impulsivity, which may be reflected in a fast reaction time and high commission error (32). 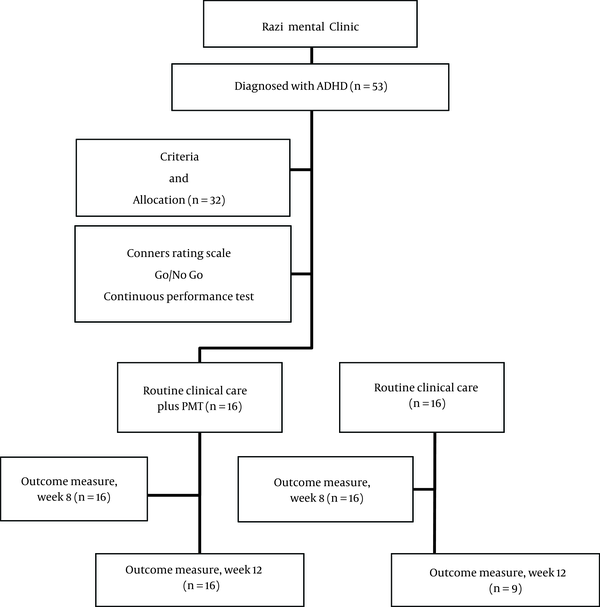 These results highlight the point that not all aspects of ADHD are measured by clinical scales and measuring executive functioning may be a suitable guide for response detection. Further studies may also reveal possible temporal precedence of changes in executive function and clinical symptoms. Another finding of the current study was that clinical symptoms of children with ADHD were significantly decreased in terms of hyperactivity and oppositional symptoms as well as total score of ADHD, when PMT was provided to their parents. This finding is compatible with previous reports (12, 33, 34). However, the current study had the innovation of measuring executive function at the same time that clinical improvement occurred. Results of these studies also confirm better effect of treatment on externalizing symptoms (hyperactivity and oppositional) compared to inattention. This also adds evidence to the fact that parenting has a powerful effect on mental and physical health of children in a wide range (35). This study had some limitations. Selected measurements used in this study did not evaluate all aspects of executive functioning of the brain. However, as mentioned before, this is the first report on the effect of PMT on executive functions and might be a basis for further studies that might utilize a wide range of assessments. This study did not include parental factors, yet psychological condition of parents may influence outcome of PMT (36). Studies have reported that high levels of maternal ADHD symptoms would influence their attention to details of the method and organization and may decrease efficacy of PMT (37). Considering the fact that ADHD is more prevalent among parents of children with ADHD, further studies should overcome this limitation with careful evaluations. Duration of the study was the other limitation. In addition, longer follow-up is needed to trace any permanent benefit. High dropout rate from the control group (RCC only) could limit the result if it was because of the difference in clinical symptoms (e.g. more severe symptoms). However, the score of Conner’s rating scale for this group was not significantly different from completers in week 8. Absence of a sham intervention was also another limitation, which could be addressed by further studies. There was also no healthy control group that could show possible benefits of PMT on children with no sign of ADHD. It is worth mentioning that we could not include a group of patients with a definite diagnosis without treatment because of ethical issues. Assessment of executive functions in home and school environments will also provide useful information. Results could be more reliable if the symptoms were rated by someone other than educated parents. This could be achieved by using the teacher’s version of Conner’s, yet was not available in this study. Instruments like behavior rating inventory for executive function (BRIEF) could be helpful as it makes possible the assessment of aspects of EF, which are related to daily life and have a parent and teacher version. Therapeutic effects of PMT for parents of children with ADHD may not be limited to clinical symptoms and may improve executive function as well. Furthermore, PMT and other non-pharmacological approaches should be regarded as a complementary treatment to medications. The study was supported by the research centre of psychiatry and behavioral sciences, Tabriz University of Medical Sciences, Tabriz. In addition, the authors appreciate Mr. Ali Bahari for his assistance. Authors’ Contribution: Ali Reza Shafiee-Kandjani, Hassan Shahrokhi, and Gholamreza Noorazar conceived and designed the study. Gholamreza Noorazar and Mohammad Ali Nazari contributed to acquisition of clinical and cognitive data. Sara Farhang performed the analysis,drafted the manuscript, and revised it. All authors read and approved the final manuscript. Declaration of Interests: The authors declare that they had no conflict of interests. Funding/Support: The study was supported by the research centre of psychiatry and behavioral sciences, Tabriz University of Medical Sciences.